A popular activity in London is to hop aboard the London Eye - a gigantic, very slow spinning Ferris Wheel with enclosed observation pods. 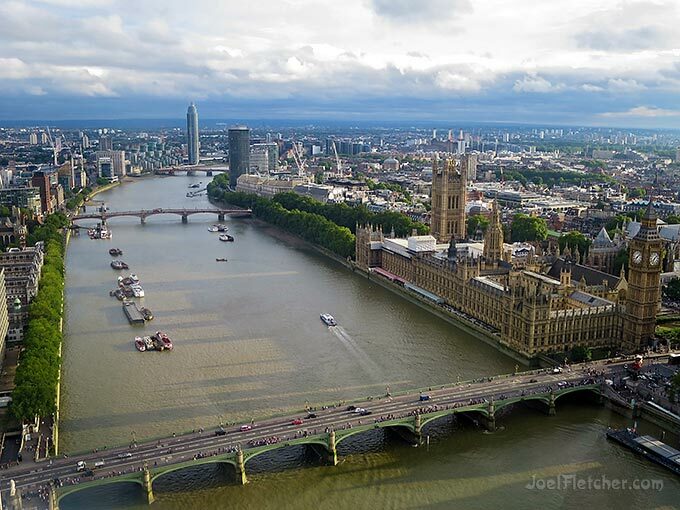 The ride provides impressive aerial views of the city, such as this shot overlooking the banks of the Thames River. Photographed in 2015. 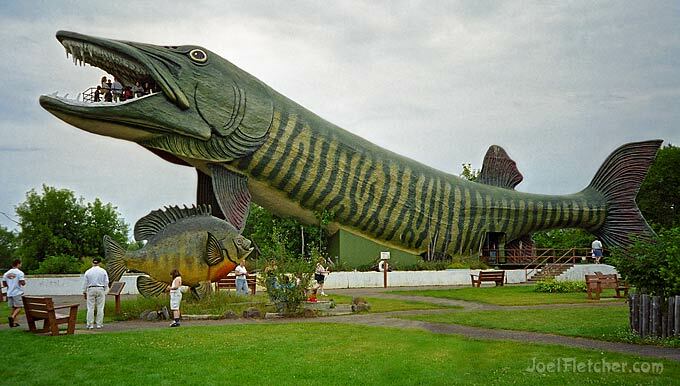 This surreal landscape with gigantic fish can be seen at the National Fresh Water Fishing Hall of Fame in Hayward, Wisconsin. There are many oversized fish statues on the grounds, but the main attraction is the enormous Muskie, which has an observation deck in its mouth! Muskie is short for Muskellunge, the largest member of the pike family, and native to North American lakes. This photo is from the year 2000, shot on Kodak gold film. Long ago, one of the most popular tourist attractions in Southern California was the Movieland Wax Museum, the largest of its kind in the United States. 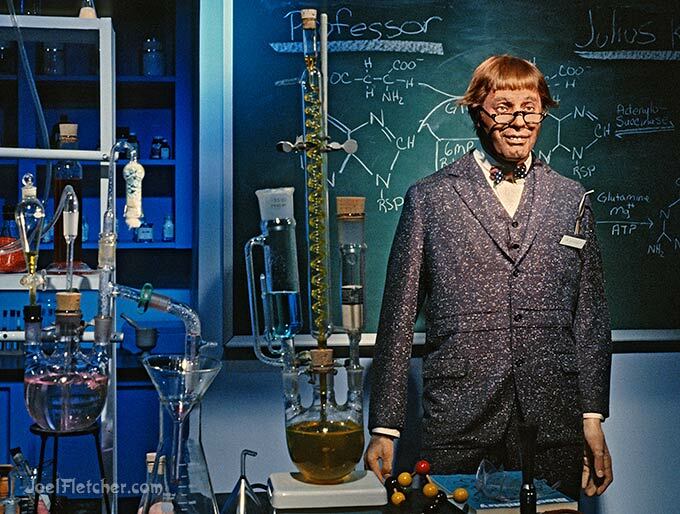 I visited the attraction back in 1991, and captured this fantastic scene from the classic Jerry Lewis film on Ektachrome film with my Nikon SLR. The museum is now long gone, as it was shuttered in 2005 and all the displays auctioned off. 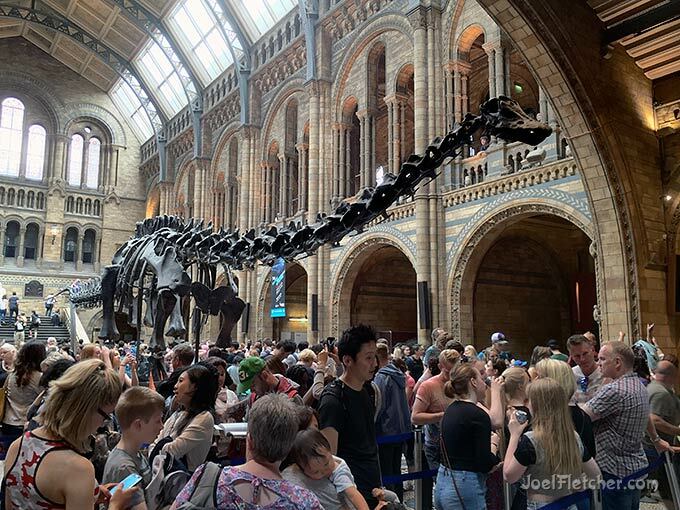 A gigantic Diplodocus skeleton looms over the crowd in the majestic entryway of the London Natural History Museum. The display is actually made of castings of fossilized bones, which were originally discovered in the western United States way back in 1898. Photographed in 2015.